Albabel. Design by Masquespacio. Photo by Luis Beltran. These days, we're happy to say good food and good design often go hand in hand, making the global restaurant scene all the more compelling. Appetizer, a hefty design tome that landed on our desk a few months ago, takes a look at some of the world's most striking and unforgettable-looking eateries. You know, the pastel-hued modern settings filled with lush greenery that you see popping up on Instagram again and again. We've excerpted ten stunners from the book, which we're bookmarking for future travel and dining plans. Design details: When Albabel's owner wanted to revamp his 20-year-old pizzeria he turned to Masquespacio to create a space that felt like home. 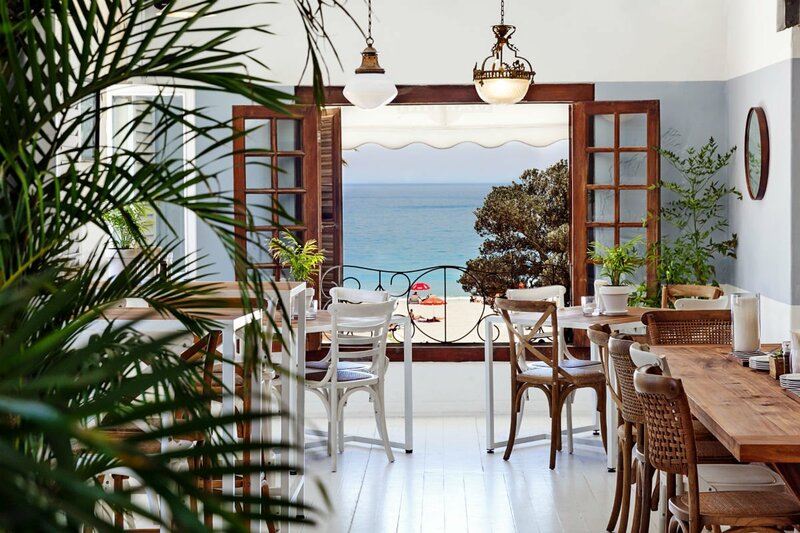 The food concept synthesizes Mediterranean with Andalusian and international ingredients, and, like the menu, the design takes from the charm and sophistication of southern Spanish craftsmanship and decor. 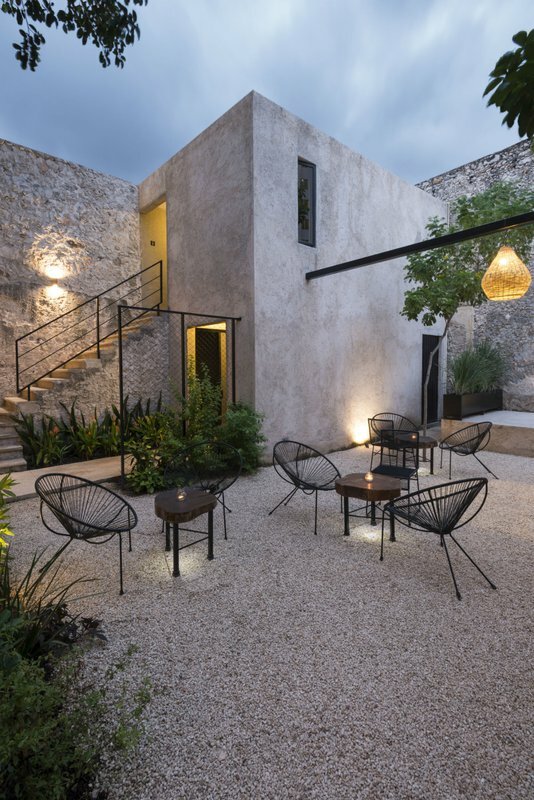 Materials such as raffia, earthen brick, and native plants fill the space, along with custom chairs and stools made from olive wood, which is common in Andalusia. Bursting colors and graphical Iberian patterns are also prominent — vibrant signatures of Masquespacios's work. Maison Premiere. Design by Charlotte Biltgen. Photo by Atsushi Yoshie. Design details: In Tokyo's bohemian Ebisu neighborhood, Charlotte Biltgen created this restaurant and events venue inside a three-story residence. 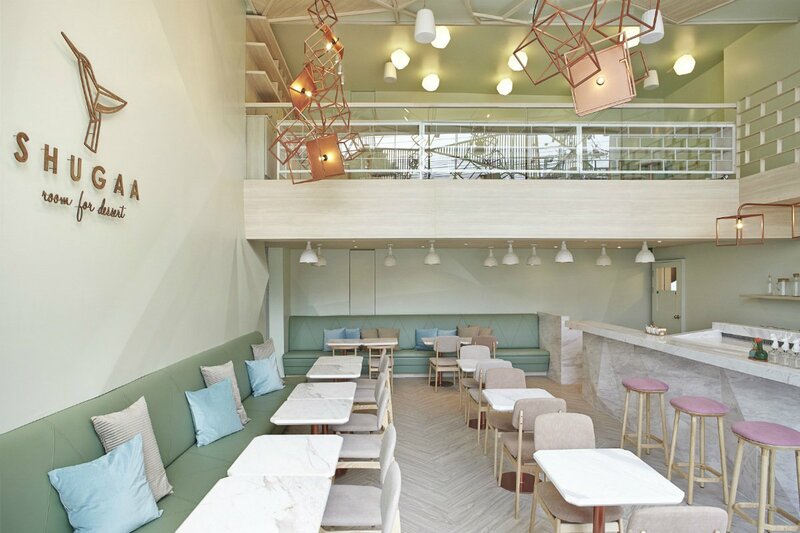 With a variety of interiors that blend Paris's conviviality with Japan's aesthetic subtlety, the design offers floral sophistication, a purity of shapes, and feminine colors. A geometric wooden screen filigrees the dining room's seating areas, and the varying heights of Arabescato marble tabletops allow guests to eat or enjoy a tasting session while standing up. With very few right angles in sight, the decor was made to measure, including sofas that incite Japanese diners to eat in a more languid position — a departure from local culture. Shugaa Room for Dessert. Design by Party/Space/Design. Photo by F Sections. Design details: This dessert bar in Ekamai offers French confections by a Thai chef. From the street, a polygonal wall installation inspired bay sugar crystals is visible. Rose-gold lighting details and the marble bar feel modern, luxe, and glamorous. A spiral "sugar-crystal" staircase anchors the eatery, an installation of acrylic boxes that has become the signature image of Shugaa. Upstairs, guests can watch the chef prepare their desserts before tucking into them in the next room, a quiet zone for reading, working, and savoring the sweets. This area can also be reconfigured in to a workshop space that offers classes. Bar/Caffé Palladio. 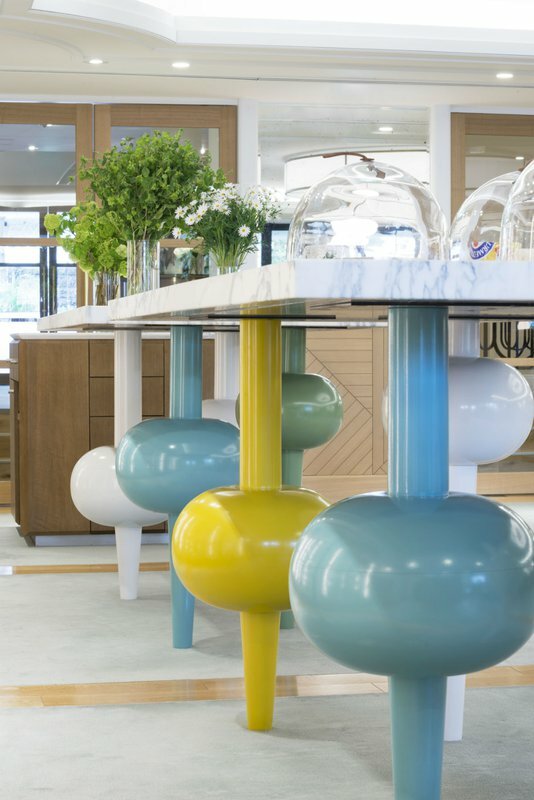 Design by Marie-Anne Oudejan. Photo by Henry Wilson. 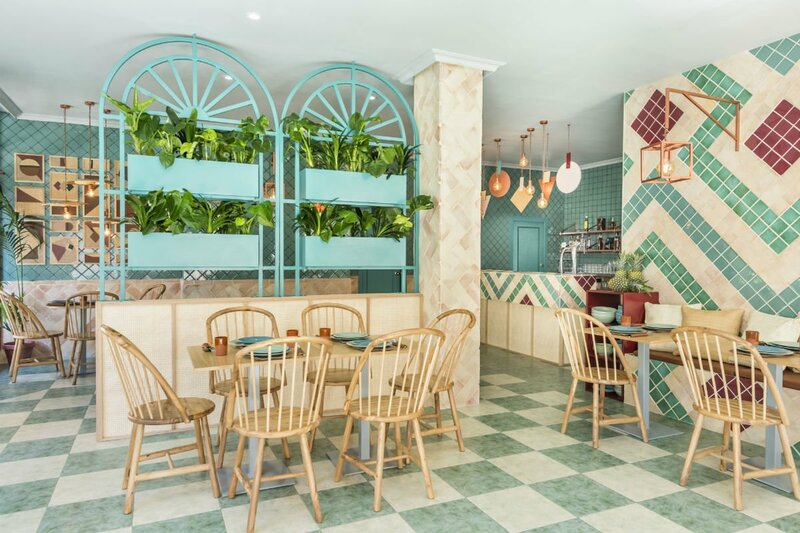 Design details: This Italian bar and restaurant in an Indian hotel and the eponymous café around the corner are the apotheosis of India's rich crossroads of visual culture. Oudejan's design, in the belvedere and gardens of a historical palace, makes the most not only its history but also the materials and mastery of regional artisans. From glass cutters to metalsmith, muralists to marble masons, locals crafted every bit of the bespoke bar. 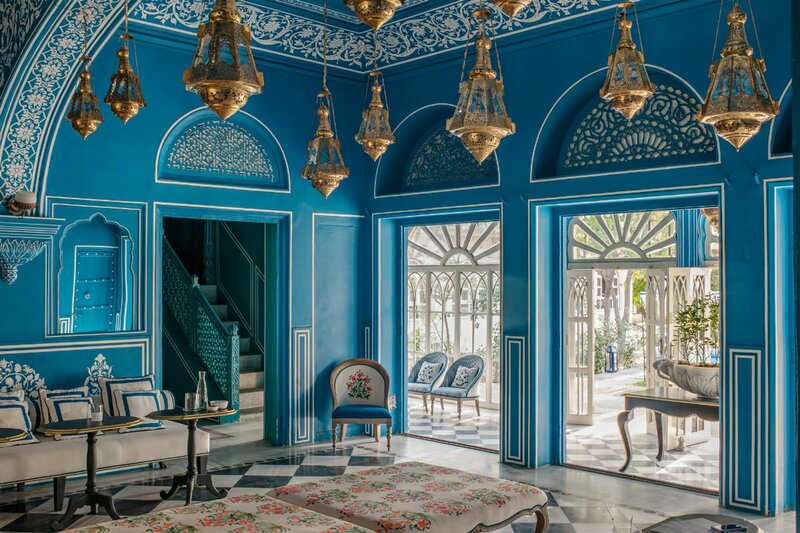 History meets contemporary detailing and the eighteenth-century European salons meet royal Mughal themes — bright blue walls and pavilion ceilings are adorned with hand-painted jungle murals and cusped arches. The Forest. Design by S&T Architects. Photo by Aleksi Gulesha. 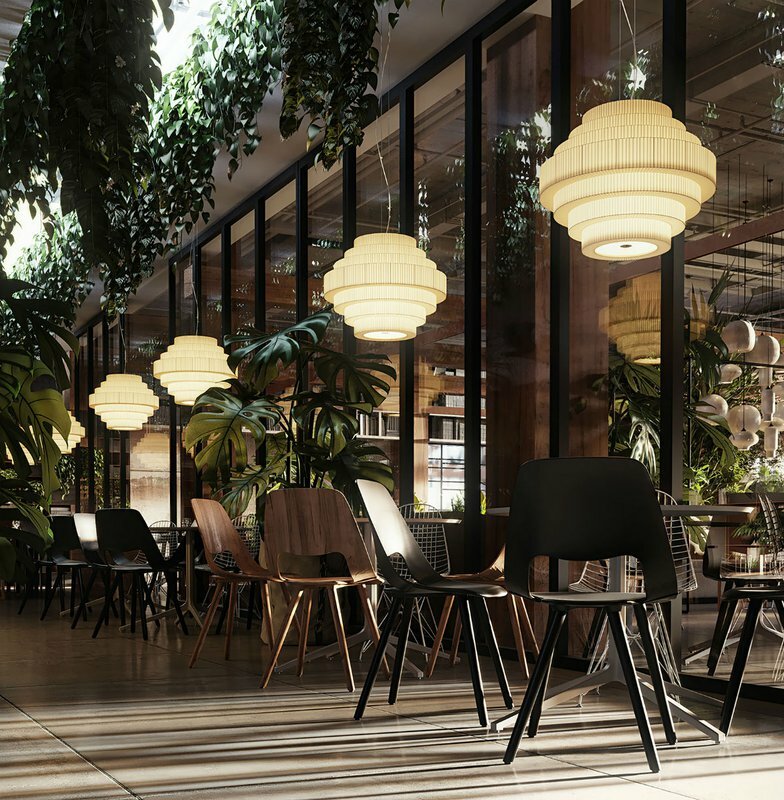 Design details: This Kazakh eatery is filled with wood and glass, cloud-like lanterns, and a lush plethora of plants. Privileging natural materials, as the name would suggests, the space underscores the organic and is embraced by and even sheltered within its foliage, which spills from planters of various types. It embellishes shelving and windows, flanks the dining tables, and cascades from the walls. The designers eschewed what they saw as restaurant clichés, avoiding the ubiquitous tufted sofas, Edison light bulbs, and industrial metal surfaces. Instead, they invoked nature's wild tidiness, in its easy comfort and its coziness. Parada del Mar. Design by Simone Briggs. Photo by Andrea van der Spuy. Design details: Guests enter a visual cocktail of laid-back chic à la Miami Beach, Ibiza, and Cuba through a threshold of patterned tiles. The menu reworks traditional Spanish food with gluten-free, low-sugar, low-carb, high-fat dining and, in its way, so does the space. The more casual lower floor leads to a well dressed upstairs, lined along one wall with a vodka bar featuring barmen in suspenders and Panama hats. A riot of pineapple wallpapers by Soil & Co. bridges the two spaces, alternating with exposed plates that referenced the heritage of the both the building and the brand. Hermana Republica. Design by Nauzet Rodriguez Ruiz. Photo by Pim Schalkwijk. Design details: Subject to the constraints of the building's monument status, Nauzet Rodriguez restored, rebuilt, and preserved balconies and doors, created high-fidelity replicas where necessary, and carefully concealed reinforcements. He describes the iron-and-wood interiors as industrial-rustic, having left the new insertions exposed for both aesthetic purposes and to avoid injecting the old stone walls. A small new concrete construction in the rear garden accommodated modern bathrooms, a warehouse, and an office. Instead of fitting the existing building to its new use, new functionality was fit to the historic building. The result is a space that feels unique and adventurous visit after visit. Cella Bar. Design by FCC Arquitectura and Paulo Lobo. Photo by Fernando Guerra. Design details: FCC Arquitectura and interior designer Paulo Lobo focused on textures and the plasticity of form in their design for this wine and food bar. Where the old structure was orthogonal and classical, the new building and its interiors are biomorphic, elastic (even the window openings are lozenge- or portal-shaped), and richly material. They are influenced by the surrounding landscape and incorporate basalt, concrete, Riga pine, and Roca ceramic. Inside, toothy trusses embellish the walls. 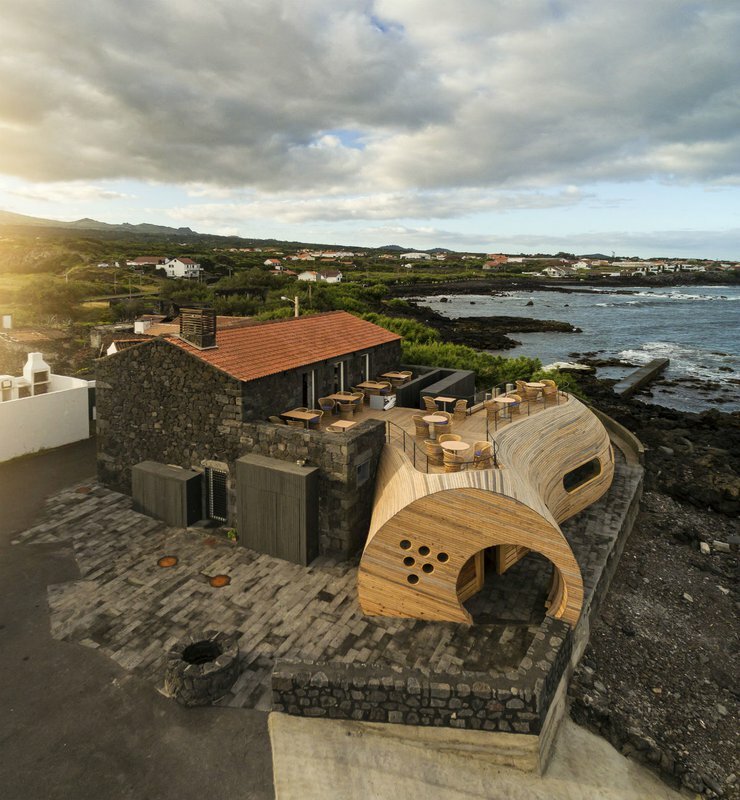 Tailored to its location, the design articulated the site with its rocky silhouette, wine casks, and the occasional breaching whale. Flora Danica. Design by GamFratesi. Photo by Heidi Lerkenfeldt. Design details: During the Enlightenment, Flora Danica was a botanical encyclopedia that presented folio-sized drawings of all the plants native to Denmark. 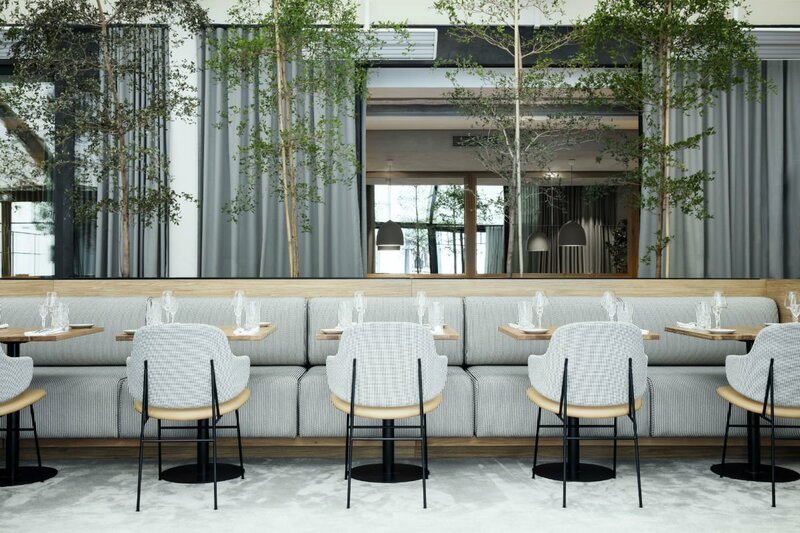 Today, it is a French-inflected contemporary Danish brasserie on the Champs-Élysées — informal but materially lush. Around the main bar, the herringbone floor features a graphic combination of Carrara and green marble. Elsewhere, the space feels serene and subtle, softened by velvet shades of gray and brass details. GamFratesi overlapped the dining room with the courtyard conflating the green color scheme of the indoors with the natural tones of the outdoors. Lingenhel. Design by Destilat. Photo by Monika Nguyen. Design details: Aging is a good thing. In this shop, bar, restaurant, and cheese dairy, maturation in any form means quality. Black, white, and wooden surfaces that will age over time reference the building's history, the production processes behind foods like raw ham, and the owner's culinary concept. Destilat popped the brand's 2D check pattern in to 3D forms to create wine displays, and conceived the dairy behind a glass wall as a theatrical space. 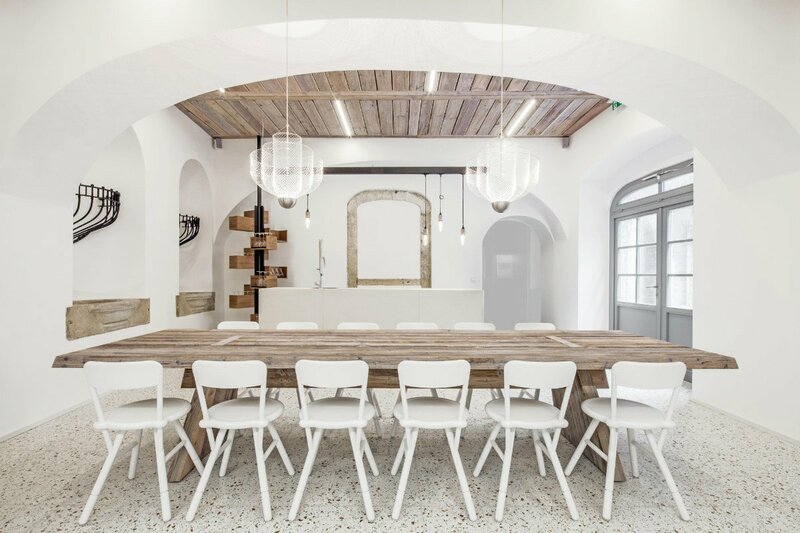 Missing raw wood beams with wire-mesh chandeliers and whitewashed surfaces gives the tasting room a feeling both modern and rustic. 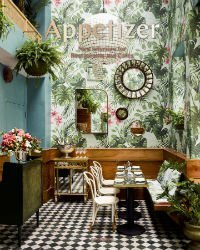 Keep flipping through this collection of stunning restaurants with a copy of Appetizer, by Gestalten. Excerpted with permission and modified for length from © Appetizer by Gestalen, Gestalten Publishing, 2017.